Since launching its dedicated app for mobile devices back in 2016, Freeview has provided Aussie TV junkies with instant access to free-to-air online streaming and on-demand content – wherever they happened to be physically. That said, most phone and tablet displays aren't large enough to do justice to the likes of Home and Away, The Bachelorette and reruns of Cheers, which is why Freeview has today made it possible for Aussies to access its incredibly convenient FV streaming platform in web browsers for the first time. Freeview is notable in that it offers a comprehensive free-to-air guide, along with both live television viewing and access to each major Australian network's catchup services, including ABC iview, SBS On Demand, 7PLUS, 9Now and Tenplay. In an effort to keep things extra simple, you don't need to sign up for an account to access Freeview FV in a browser. That means, of course, that there's not a lot in the way of customisation available. While you can add programs to a list of favourites by clicking on the 'heart' icon next to each title (which will then collate those into a list of your liked shows in a personalised schedule), that list will only be saved on the current device you're using via browser cookies. 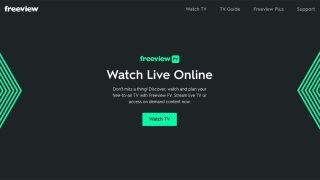 Over time, Freeview says it's hoping to add more features to the site, including things like cross-network program recommendations based on your viewing habits. To check out Freeview's new web interface, simply head over to the platform's website, click on the 'Watch TV' button, and voila – you're off and running!